Andy Sugg is a leading Australian saxophonist and band leader based in Melbourne. His musical influences are eclectic and he performs in a range of styles derived from jazz and other contemporary music. 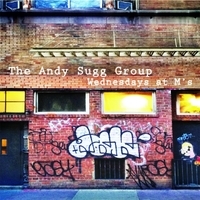 The Andy Sugg Group’s music embraces an range of compositional influences, which includes contemporary jazz, funk, R&B and avant-Pop. The ASG is Andy’s “blowing band;” it’s his vehicle for extended improvisation in the best traditions of contemporary jazz. The ASG's new album, Wednesday's at M's, was recorded in NYC in January 2016 and features Sean Wayland (piano), Nate Wood (drums), Ben Eunson (guitar), Matt Clohesy (bass), Christian Almiron (synth) and Kate Kelsey-Sugg (piano and voice). Andy's previous album, The Berlin Session, was recorded in Germany in 2011. It explores a more acoustic avant-garde setting and features Kate on piano, with Berliners Jan Leipnitz (drums) and Sean Pentland (double bass). While firmly grounded in its stylistic time and place, this is music that has left home. It is music in the moment, played by highly articulate musicians with something to say both as soloists and as members of a collective. An earlier album, Brunswick Nights, was recorded live in Melbourne; and prior to this, After Utopia, featured New York sax legend David Liebman in his first recording with an Australian group in over a twenty-five year association with that country.